Shortly after the game’s removal in North America its PlayStation.com page was also updated to reflect this information. While the game can no longer be purchased in North America or Japan, it was included in the PlayStation Plus Instant Game Collection in 2017 and can still be downloaded to a PlayStation 4. As of November 2018 the game remained available to buy in Europe and Australia but was delisted between December 2018 and March of 2019. While many older titles have their online services retired several years after release, Drawn to Death is being removed and shut down just under two years from its debut.This would indicate the delisting is due to the game’s low player base, popularity, and critical reception. 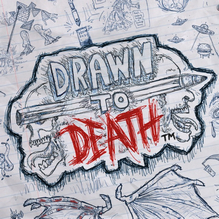 “Acclaimed video game developer David Jaffe, director of multiple franchises including God of War and Twisted Metal, is back with the PlayStation®4 system exclusive—Drawn to Death—a chaotic, third-person death match shooter played out on the lined pages of a teenager’s notebook.